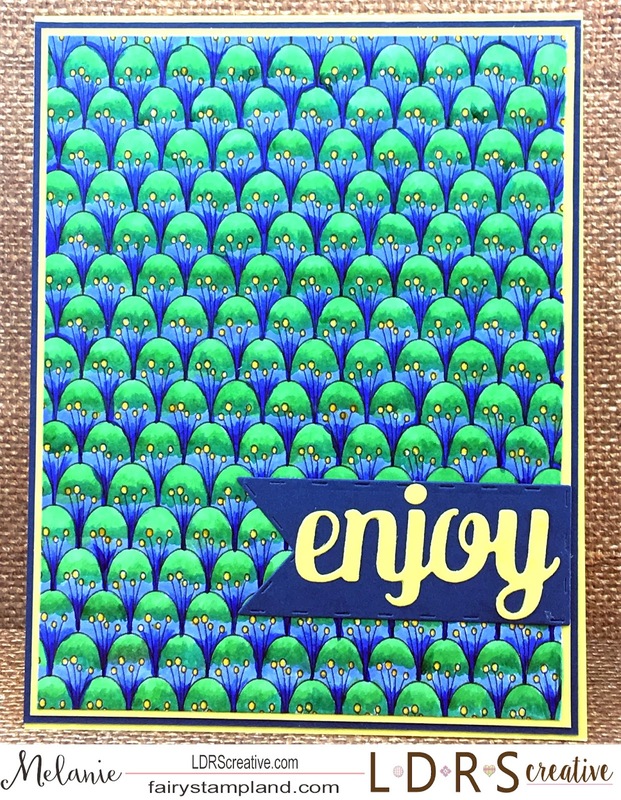 I am excited to share today's midweek Magnolia-licious card. Join us over on the CHALLENGE BLOG for your chance at winning a $20 gift certificate. I am showcasing C.C. Designs Pixie May Day. Isn't she perfect for spring? I know I for one is READY for the spring flowers!!! Actually on that topic I noticed our first Daffodil in bloom in our backyard flower garden today. Now if freezing temps will just stay away we will slide right into spring! This is an A-2 card and I have colored the stamp with Copic markers. I have just minimal embelishments because I really wanted this little pixie to jump off the page. C.C. 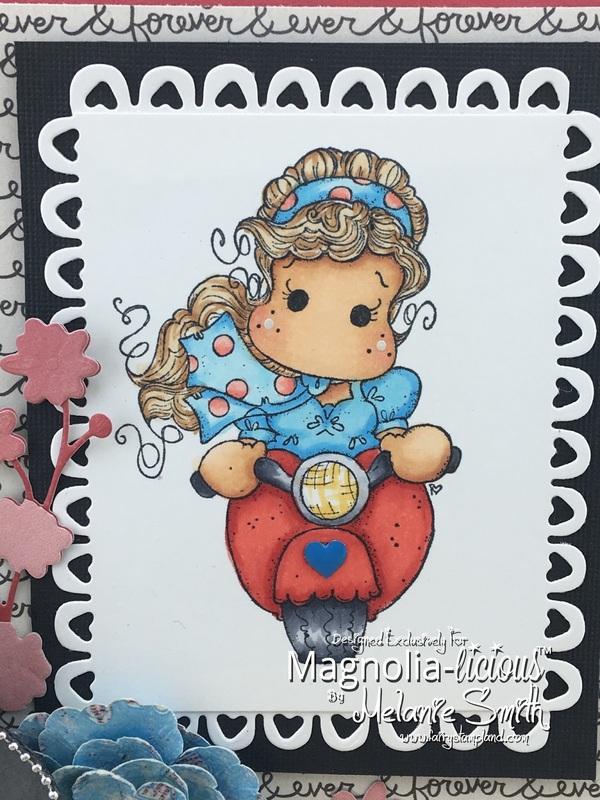 Designs is just one of the stamp brands Magnolia-Licious now carries. Make sure to head to the ONLINE STORE to see all of the current specials. Today I decided to showcase the Peacock Feathers Background Stamp. 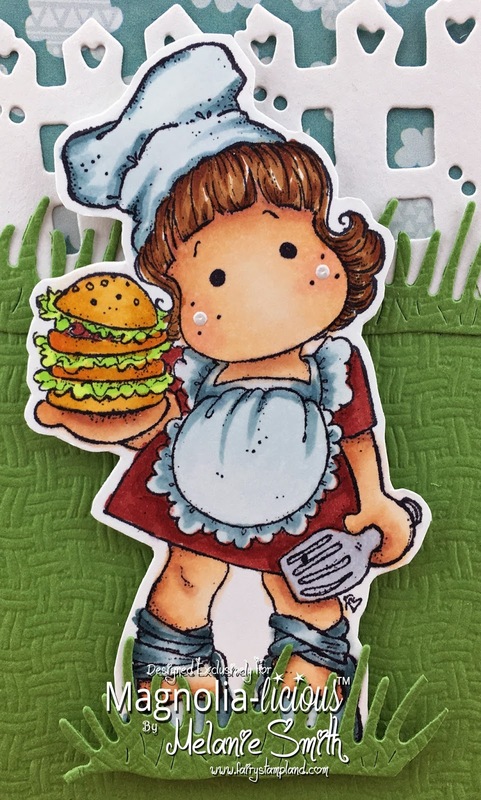 I wanted to showcase the stamp not just as a background but as a focal as well, so she used Copic markers in B29, B23, G17, G14, and Y17 to color this. 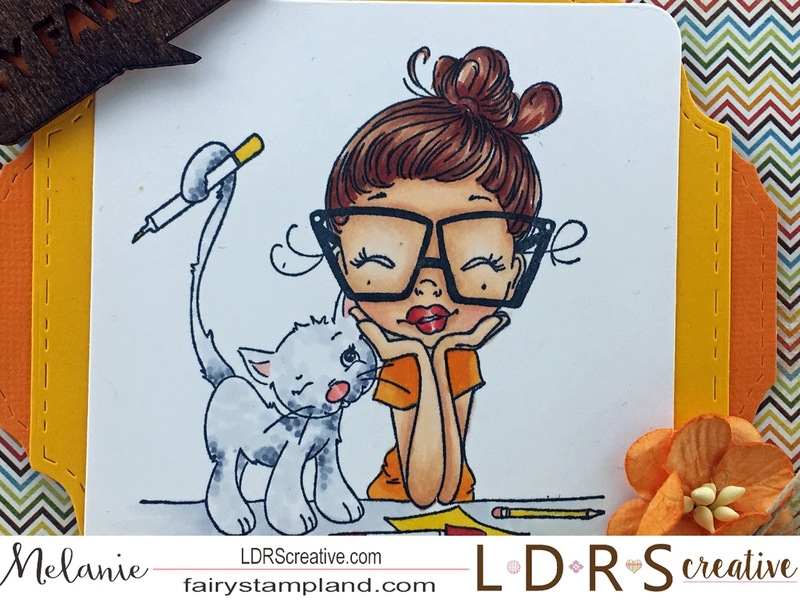 This vibrant background just pops off the page but not only can this be colored with Copics but also think of the possibilities with sponge daubers, brayers, etc. The possibilities are endless. Basic Stitched Flag Dies were used for the sentiment. 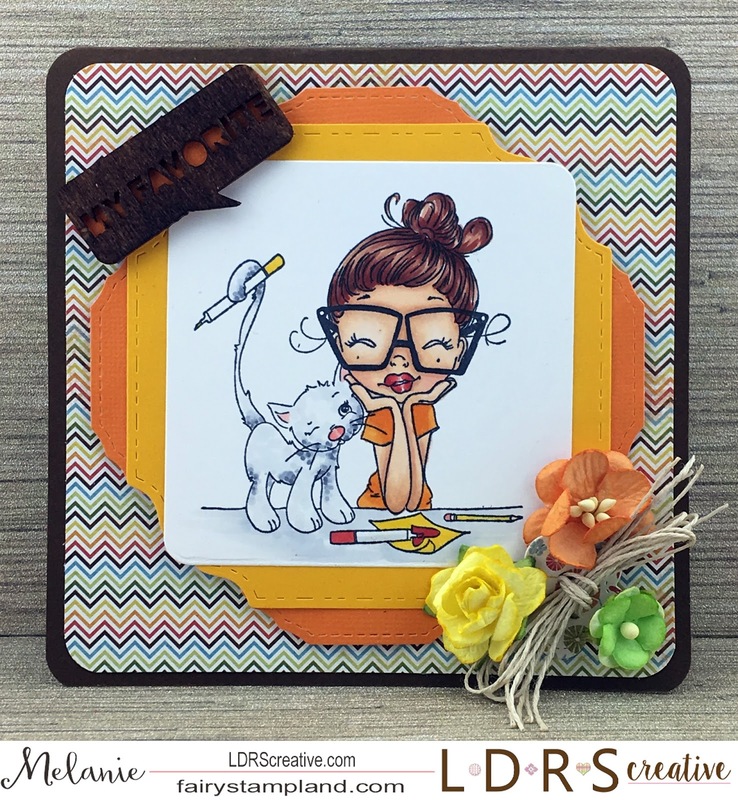 I have an amazing little stamp & die set to share with your today. Elizabeth Craft Designs' has released 14 brand new stamp & die sets and "Flower Power" is one of my favorites. 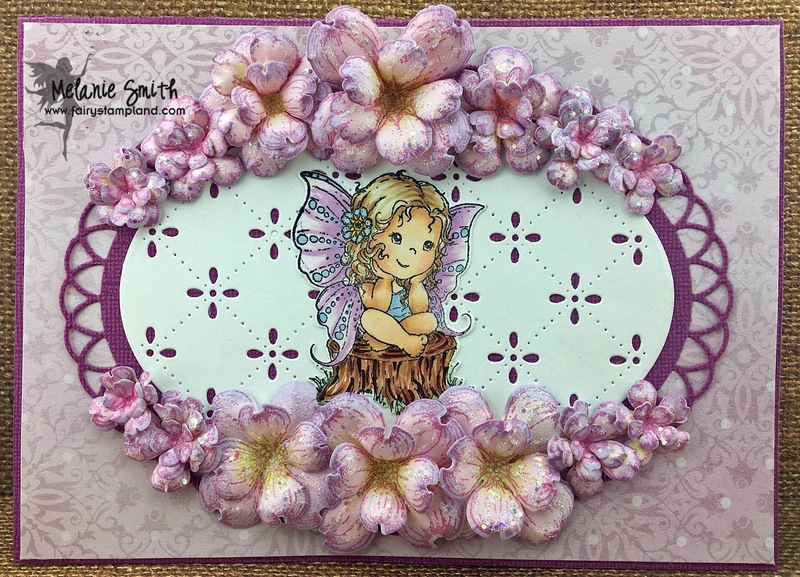 To recreate this card you will simply cut a 5"X10" card base and fold in half to form a 5"X5" card. 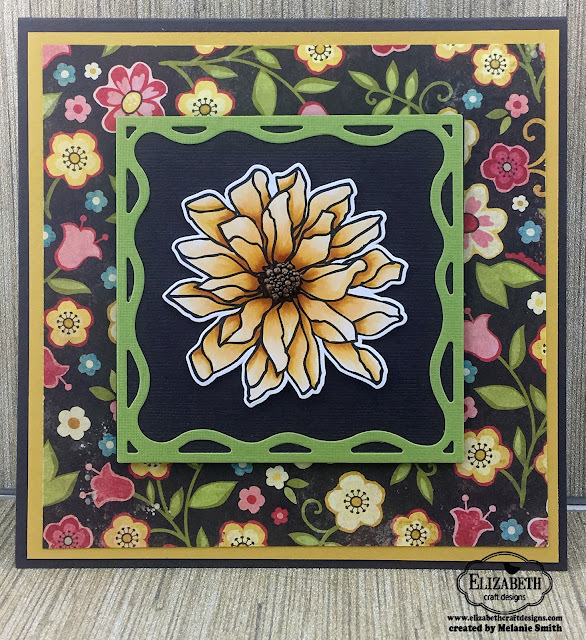 The yellow mat is 4.75"x4.75" and the floral paper is cut 4.5"x4.5"
I have used the Fitted Frames 4 ~ Curvy Squares to cut the green frame. When using this die use a 5"x5" piece of paper so you can cut all the different sizes of curvy squares all at once as seen here. I have only used one frame in this project but you get numerous different pieces all from just one pass through your die cut machine. 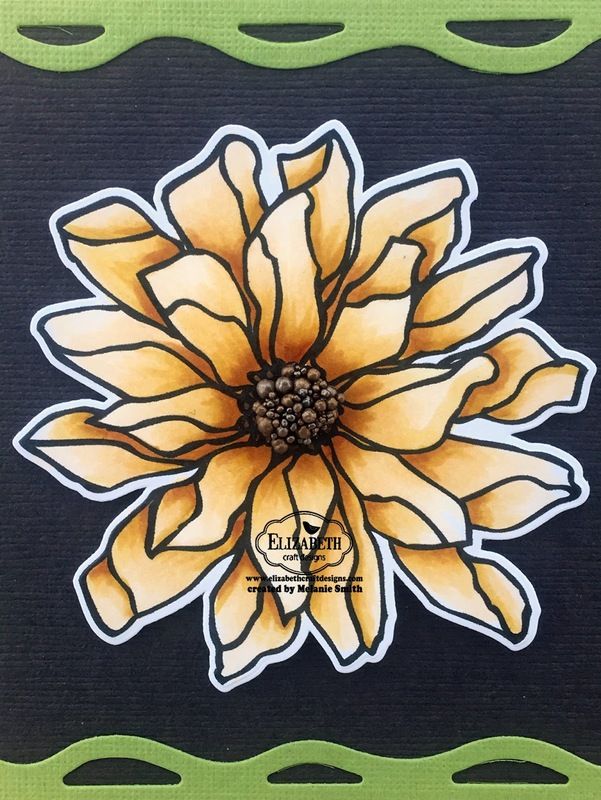 The focal flower here was stamped on Copic X-press It paper using Momento Black Ink. It was then colored using Copic Markers. 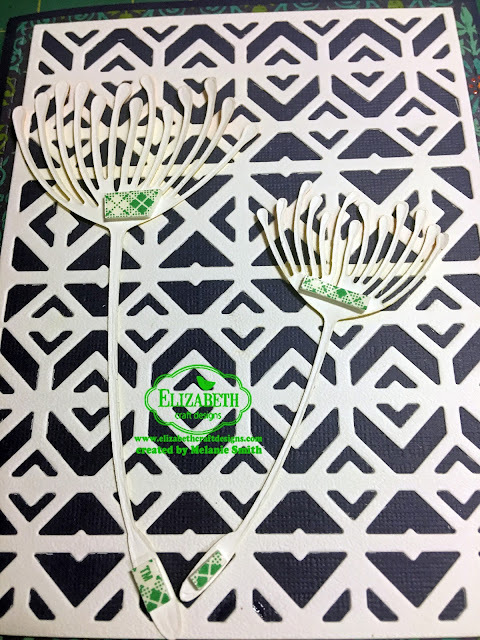 Once colored I die cut it using the coordinating Flower Power die set. I used Prills in the center of the flower for extra dimension. 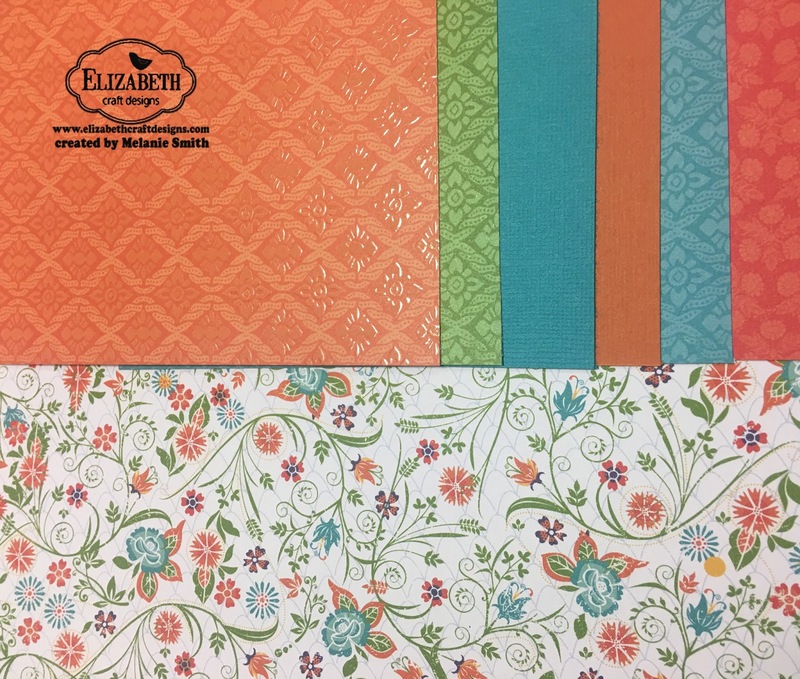 If you would like more information on any of the Elizabeth Craft Designs' products listed in this post click on over to the ONLINE STORE. Also make sure to check out our challenge blog...we would love for your to play along with us. I just received notice that Heartfelt Creations has chosen me as one of their semifinalists for their 2017 design team call. I submitted 3 projects along with step by step instructions and the top 20 were just announced on the Heartfelt Creations Blog. I am super EXCITED and HONORED to even be considered. I am constantly looking for ways to grow as an artist and I know that working with Heartfelt Creations would allow me to grow even more. Thank you Heartfelt for allowing me to move forward in this journey. What's the next step you ask??? To make it to the finals all I need for you all to do is VOTE. They are asking for YOU to choose your top 5 choices to move to the finals. So please look over everyone's projects and vote for your top 5 favorite artists. To view all the semifinalists visit the Heartfelt Creations blog. To vote please click HERE. You must vote for 5 different people to enter. Here are the first of my three submitted projects. 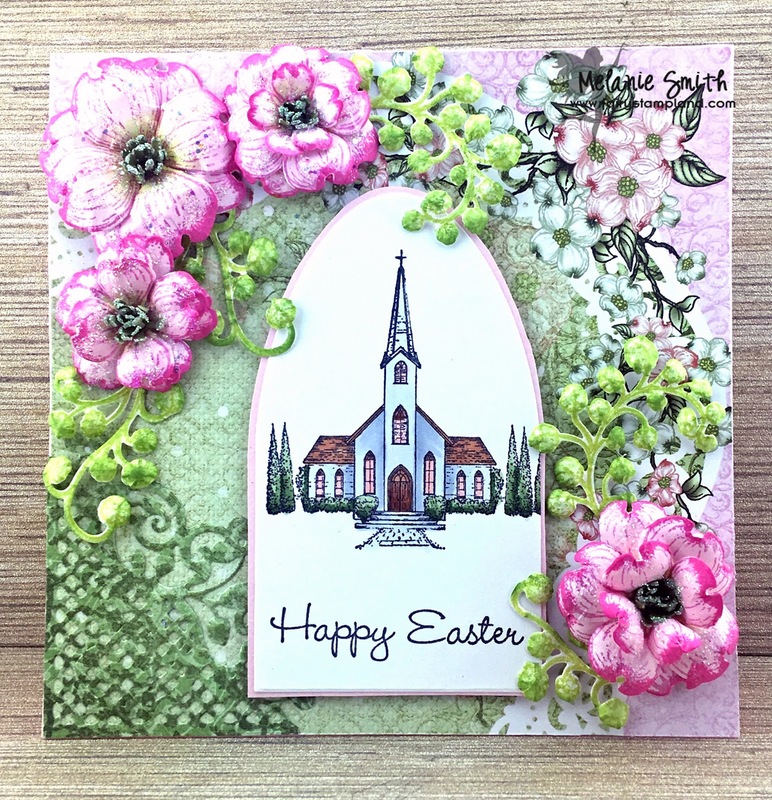 With this card I have used the Flowering Dogwood Collection for the stamping, Paper and the floral parts of my card. 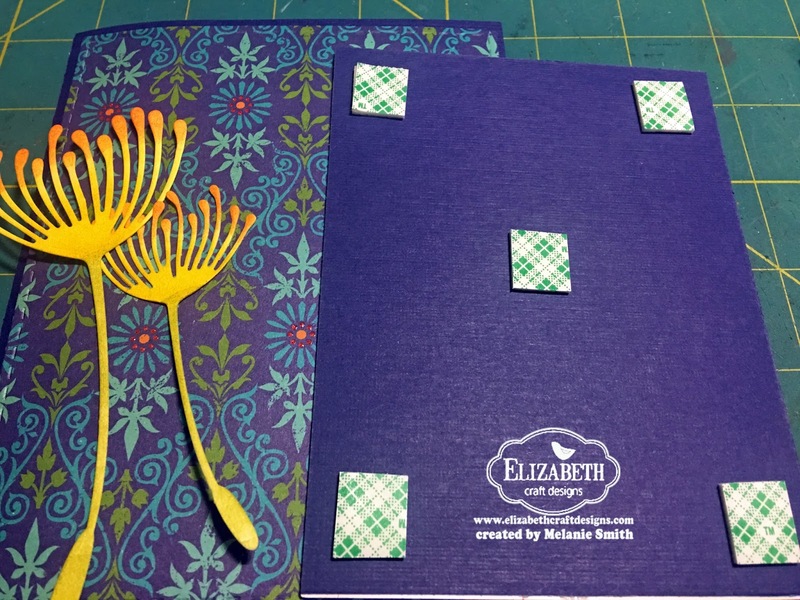 I also used the Botanical Window Die Set and the Fleur Borders and Pockets Die Set. For the coloring medium on the chapel I used Copic Markers. Here is a close up to show the details to the flowers. Fairystampland would not be complete without me using the Wildwood Cottage Collection. Coloring this project with my Copic markers was such a joy. 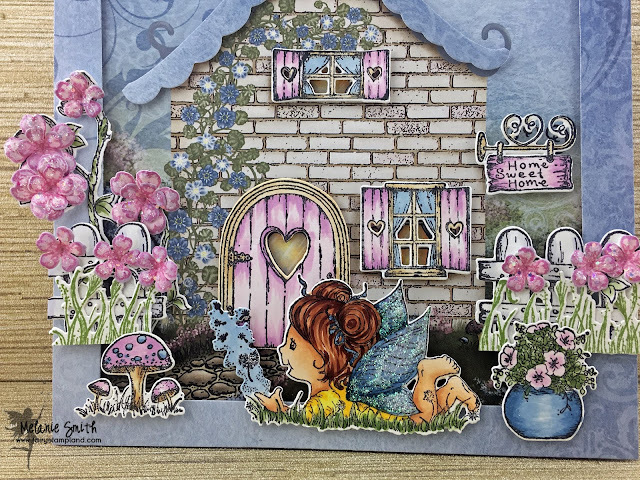 The cottage itself is from the actual paper collection but I hand colored all the windows, doors, sign, fence, flowers and the fairy and have them attached with foam tape to add dimension. 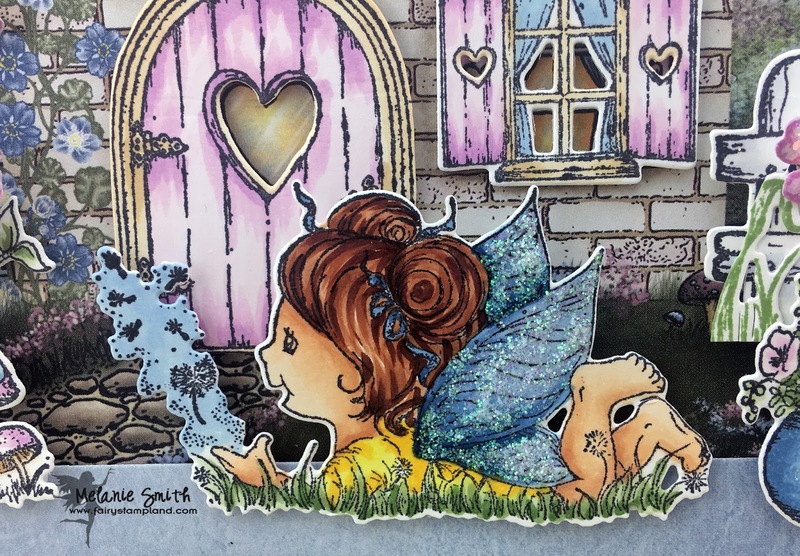 This sweet little fairy scene was by far my favorite project to create. It is truly magical. See below for more photos. I have combined the two collections (Flowering Dogwood Collection as well as the Wildwood Collection) to create this stunning card. The flowers are from the Flowering Dogwood Collection and they are all hand shaped, colored, and glittered. The stamped fairy is from the Wildwood Collection and is colored with Copic Markers. 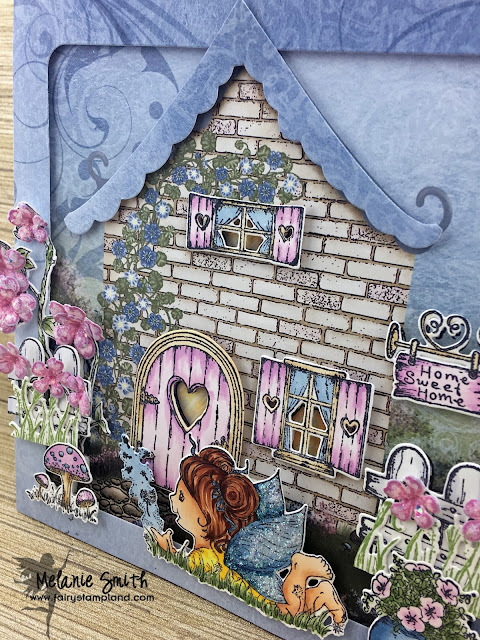 The Eyelet Oval Die set was used for the multi layer backdrop for this lovely floral fantasy. Thank you for stopping by and for considering me for your vote. I am blessed just to be a part of this process. 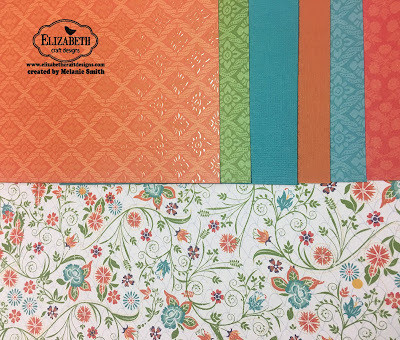 Elizabeth Craft Designs is kicking off a brand new coloring challenge over on our challenge blog. I hope you will click on over there and check out all the details. 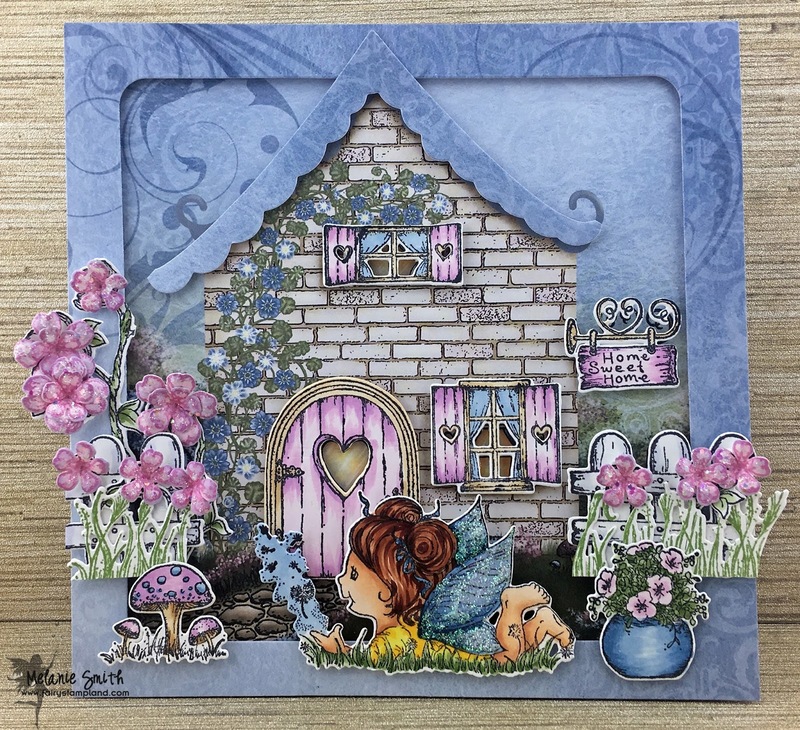 I have an amazing little stamp & die set to share with your today. 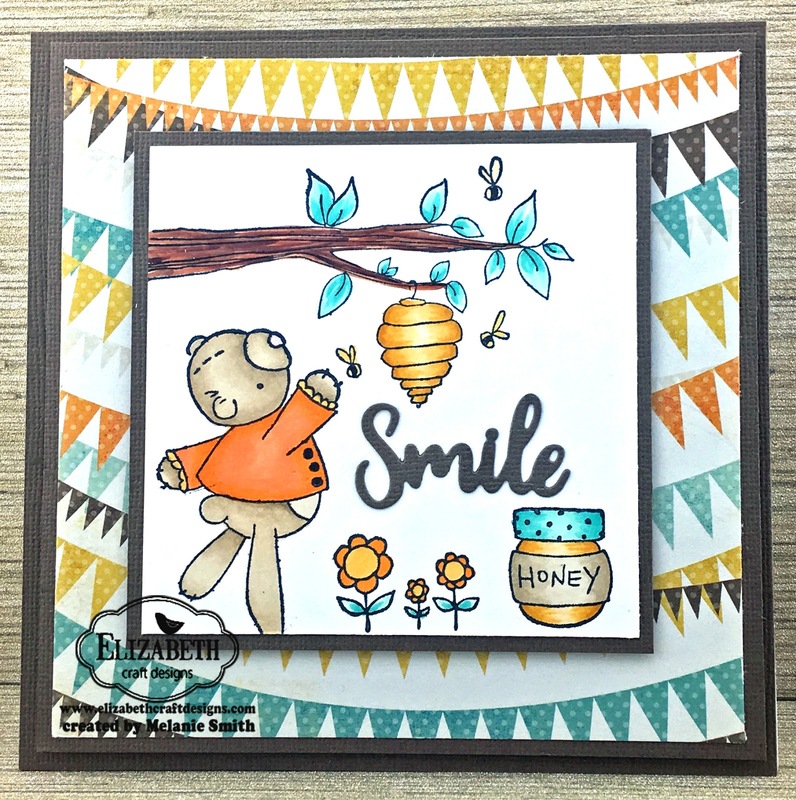 Elizabeth Craft Designs' has released 14 brand new stamp & die sets and this is "Honey Bear". For this card I used a 5 3/4" square card base in white. Step 1: Cut 5 3/4" square from a piece of brown card stock to cover the front. Step 3: Cut a 5 1/4" square of designer paper. Step 4: Cut a 3 3/4" square piece of brown card stock. Step 5: Cut a piece of white Copic Xpress It paper to 3 1/2" square and color with your Copic markers or alcohol markers of your choice. 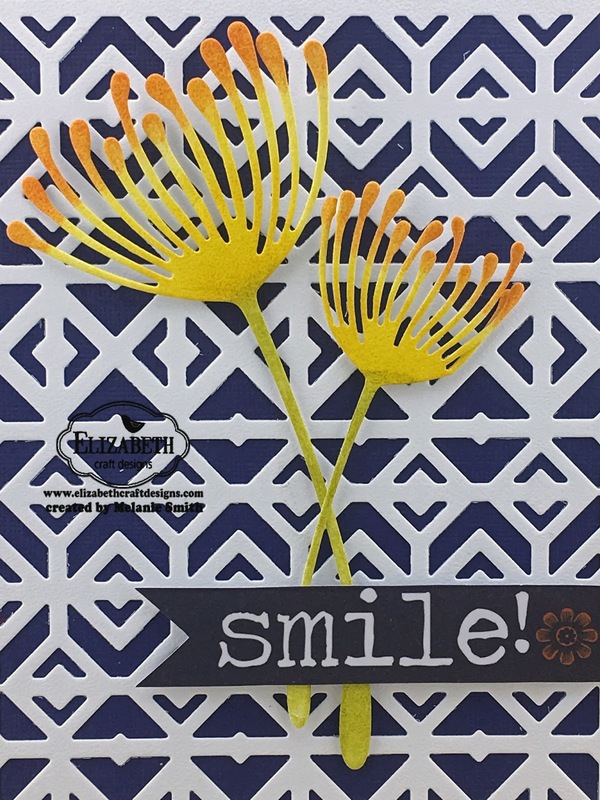 Step 6: Die cut the "Smile" sentiment with brown card stock and attach to the white paper. Step 7" Use liquid glue and foam tape to assemble the card. I am all ready for the weather to heat up and for burgers on the grill.... This winter's weather has been hit or miss, and quite warm actually... makes me wonder what Mother Nature has in store for us? So I am bringing you "Burger Tilda" today as part of the Magnolia-licious Challenge Blog. 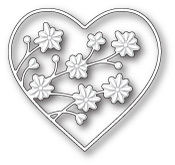 I have used numerous dies from the Magnolia DooHickey Die Collections. You can see lots of awesome dies in the Magnolia-licious Online Store, where dies are always on sale. Here is a closer look at little miss Tilda. Isn't she just as fun and sassy as she can me? I used my Brother Scan & Cut 2 to cut her out with and it did such a wonderful job. 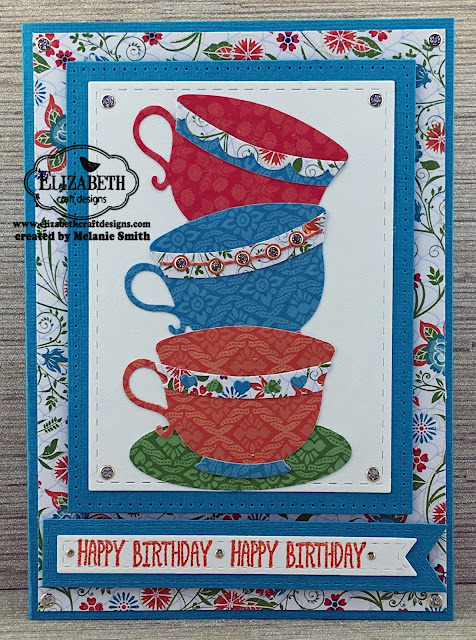 Elizabeth Craft Designs Card Featuring Our NEW Dies! 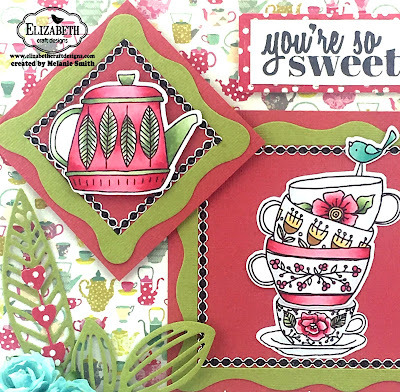 Today I am bringing you a card created using Elizabeth Craft Designs' new die release. We had a huge release in January and these dies are amazing to work with. I am featuring two of the newest ones here today. This card is made exclusively with Elizabeth Craft Designs' dies. 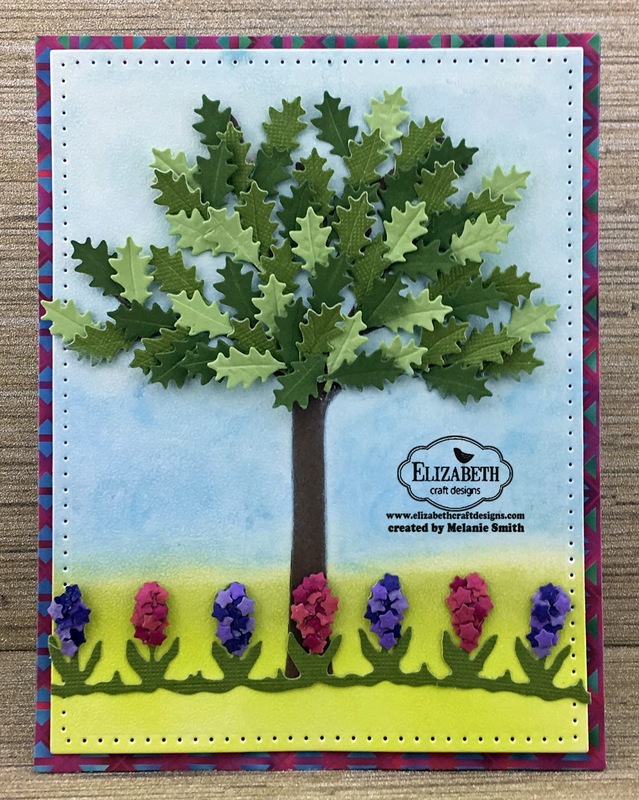 The base card is cut using the Stitched Rectangles by Els Van De Burgt Studios. 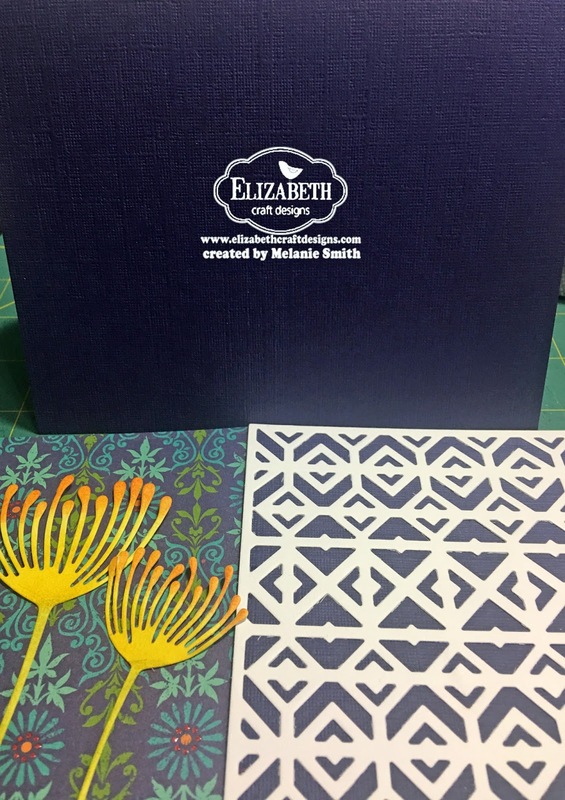 The white piece is cut from ECD's Soft Finish Cardstock using the new Diamond Background Die by Joset Designs. die, and the focal is the new Dandelion Fluff Die by ModaScraps. The first thing I did was cut a card base and backing piece for the background die out of dark blue card stock. I attached the dark blue piece to the back of the diamond background stamp so that the inked Dandelion Fluff die would show up nicely. I have used distress inks to ink up the Dandelion Fluff Die. 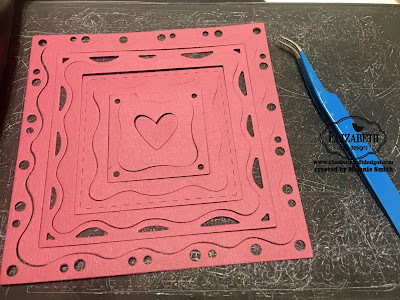 I cut a piece of patterned paper and added it to the card base before adding the diamond background die using foam tape to add dimension to the card. I also cut some foam tape to fit along a few areas of the Dandelion Fluff die so it too would pop up on the card front. 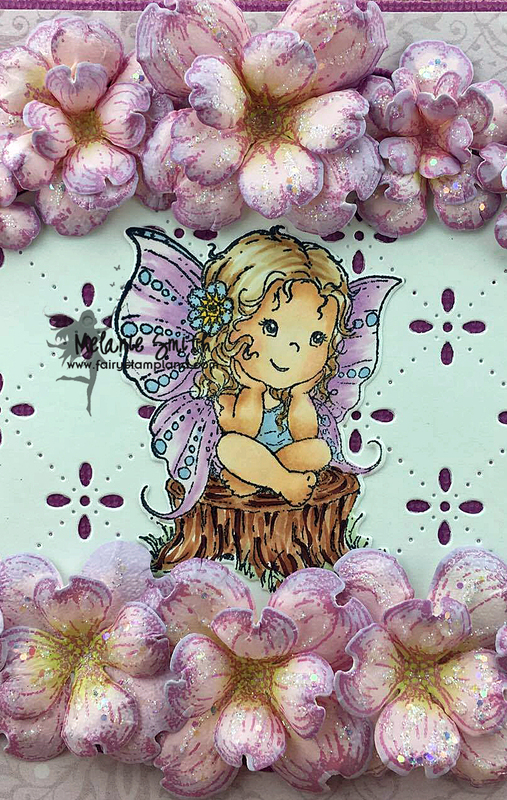 The sentiment was fussy cut from the same paper pad that the background came from. The final card is quite striking. 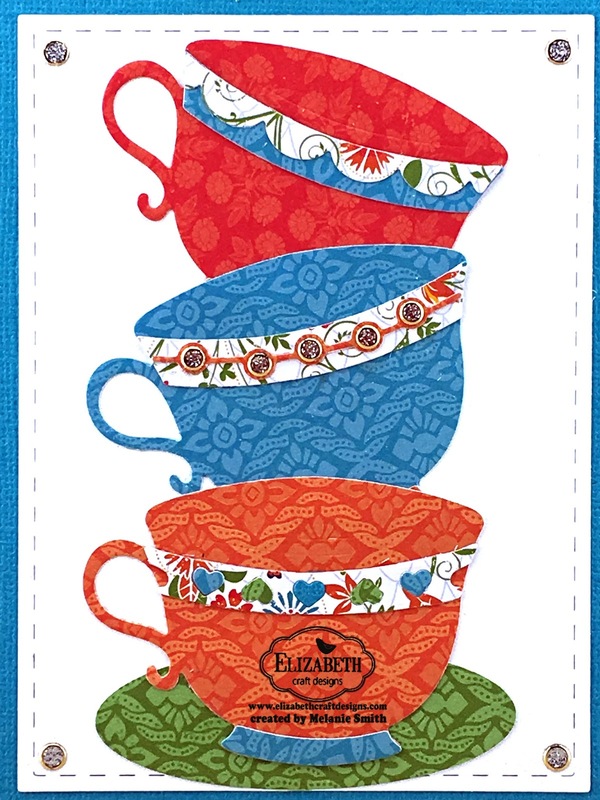 I'm here today to share a really playful card made from Elizabeth Craft Designs Products. 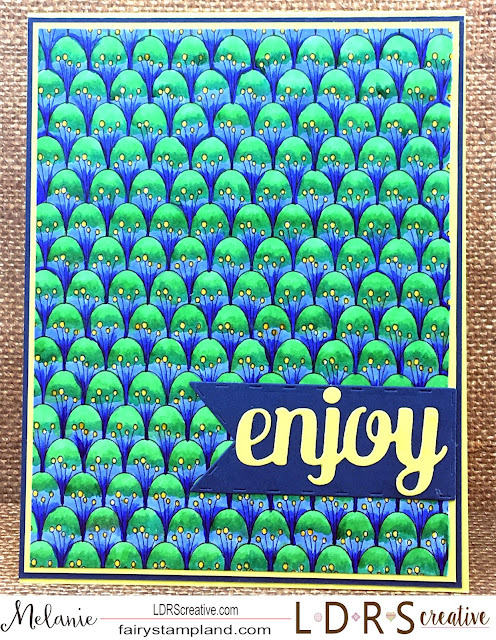 This card was a labor of love but it was such a joy to make. I love creating scenes and this All Seasons Tree die set from designer Karen Burniston is perfect for making scenes for every season. 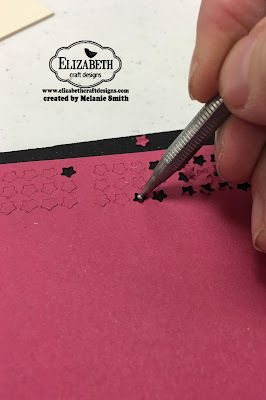 Step 1: Using your Stitched Rectangle die set (second largest die) cut yourself a pierced layer of Soft Finish White Card Stock. 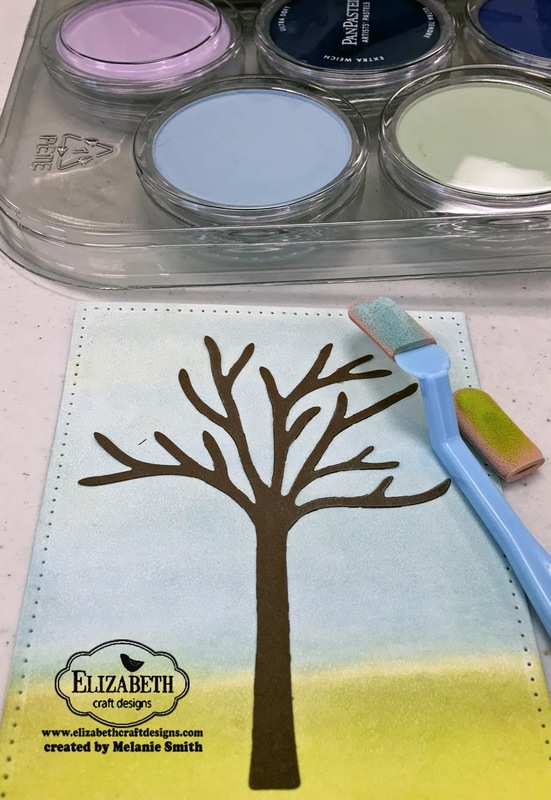 Step 2: Use Susan's Garden PanPastels to lightly color the background in blues and greens to create this simple background. 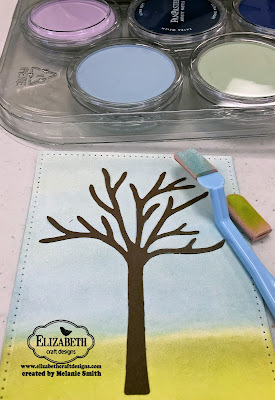 Spray with a fixative to prevent smearing. 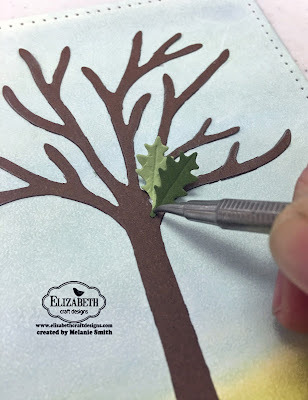 Step 3: Die cut 1 tree base along with lots of leaves from the All Seasons Tree die set. The set comes with multiple leaves to choose from. The Oak leaf is used in this sample. Step 5. Using Susan's Garden tool kit and a leaf pad add a crease to each of your leaves. This adds dimension to your leaves. Step 6: Dip the stem end of the leaves into liquid glue before applying them onto the tree. 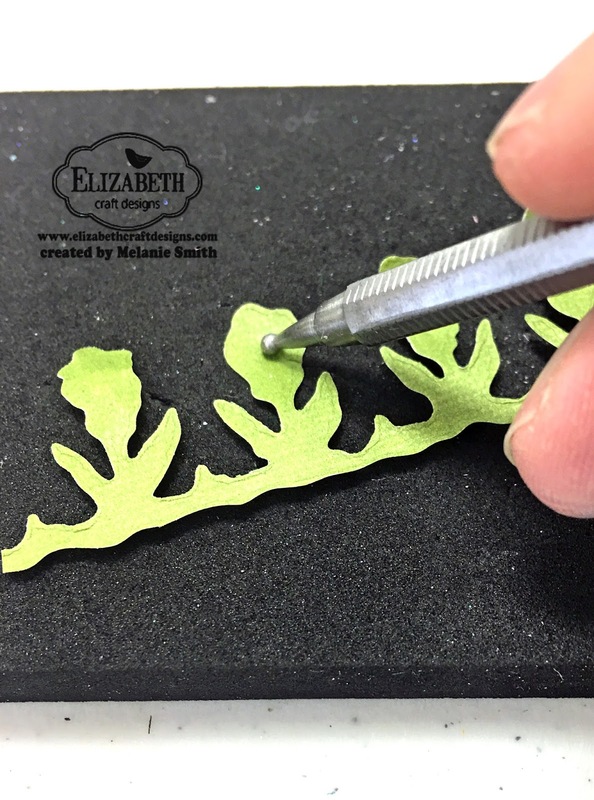 It helps to use a tool to hold just the tip of the leaf down for a count of 10 seconds to allow for the glue to begin drying. 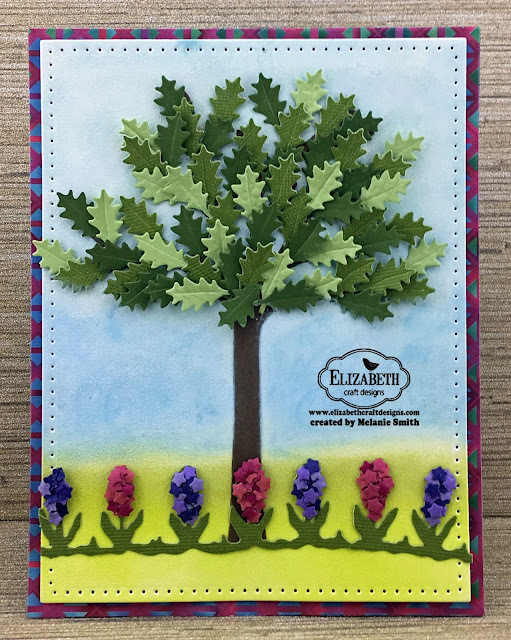 Step 7: Die cut the CountryScapes Garden Edges - Hyacinth, green for the stem piece and multiple pinks and purples for the flower petals. 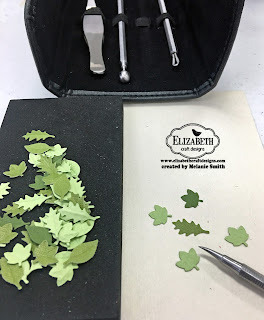 Step 8: Turn the green leaf strip over and using the smallest ball end of the stylus and press he backs of each of the flower sections to give them a little curve. Step 8: When punching the small petals out of the die use the small ball end to push the tiny petals out with the molding pad underneath. 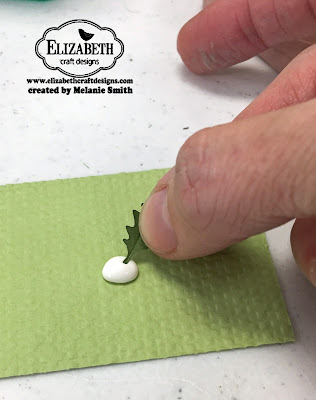 This gives them a little cup shape as well, and more dimension when gluing them down. Step 9: Assemble your card using a A2 card base (4.25x5.5) and a piece of designer paper to match your card front. Today I am bringing you a sweet card featuring a Saturated Canary stamp by LDRS Creative called "Crafty Cat"
This was such a fun stamp to color and one all Copic colorists should own!!! Look at this Purrrrr fect kitty helping with the coloring... Such a sweetie! 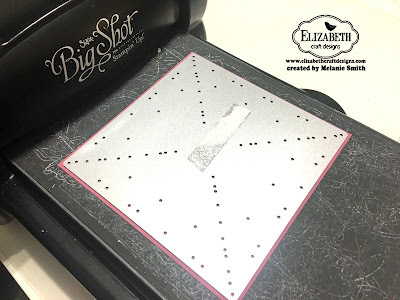 I am here today to share a card I made with a really fun stamp and die set from Elizabeth Craft Designs' brand new stamp line by Krista Schneider. 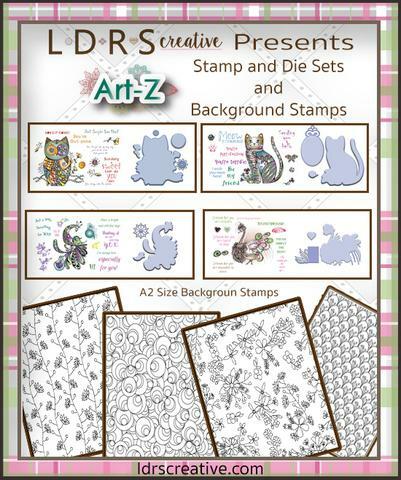 These adorable sets have such a whimsical feel to them and are perfect for coloring with any medium. 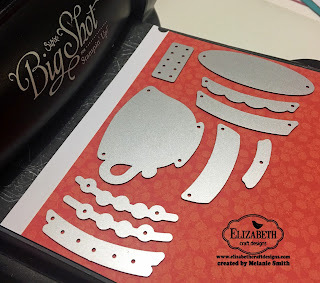 The matching dies are so precise and make just wonderful projects. Step 1: From your first color cardstock cut a 6"x 12" rectangle, score and fold in half to form a 6" card base. 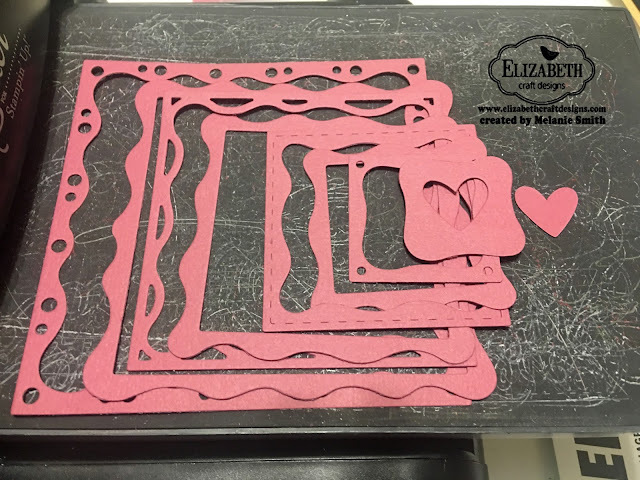 Step 3: Cut a contrasting solid color piece 5" x 5" and cut with the Fitted Frames 4 die. I used green in the project, but in the photos below I used pink as an example. To ensure that all of the details got cleanly cut, I used the Big Shot machine with a Precision Base Plate and ran it through twice. Alternatively, use a Metal Adaptor Plate from the Elizabeth Craft Designs Online Store inside your machine's usual cutting plate sandwich. The Elizabeth Craft Designs Tweezers are perfect for poking out any little pieces that stay in the die and inside the cut pieces. punching out the little pieces from the die. 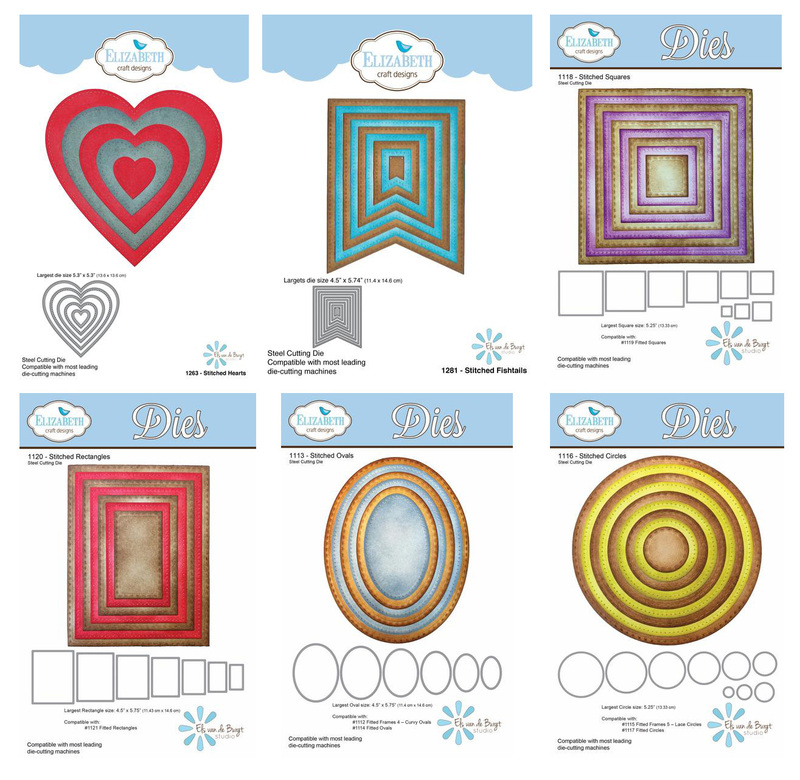 Below are the 9 pieces that this one die cuts - 8 frames and a heart. Look at all those beautiful pieces....So many choices all from one die - pure magic! 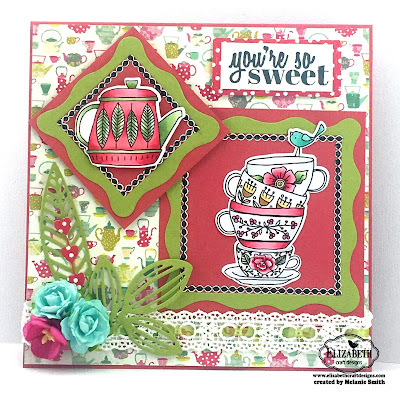 Step 5: Using black permanent ink on white card stock, stamp the teapot, stack of teacups and 'you're so sweet' sentiment from the Tea Time Clear Stamp Set. 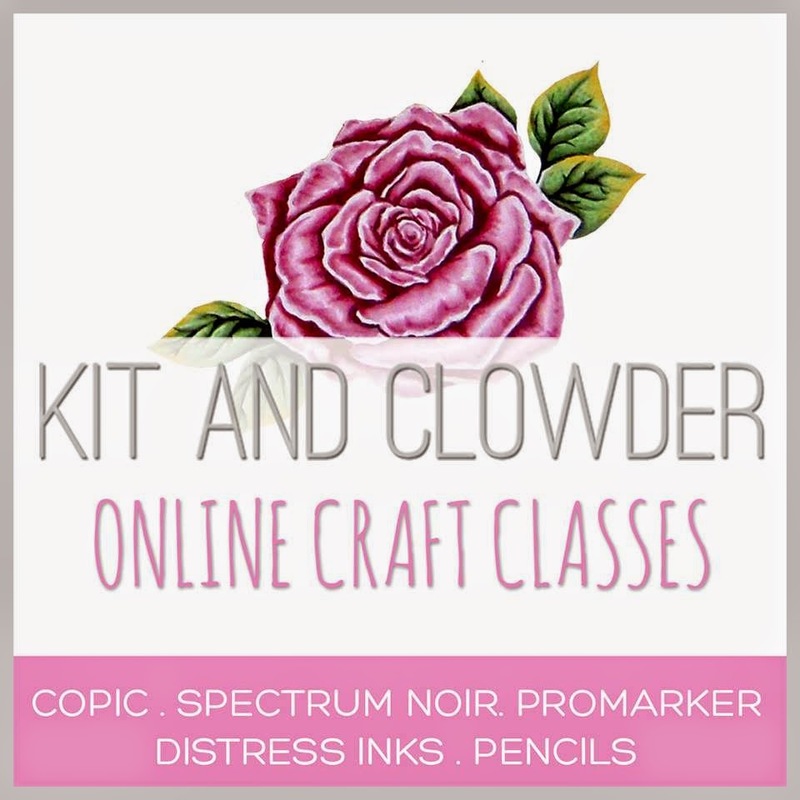 Color with markers or pencils of choice. 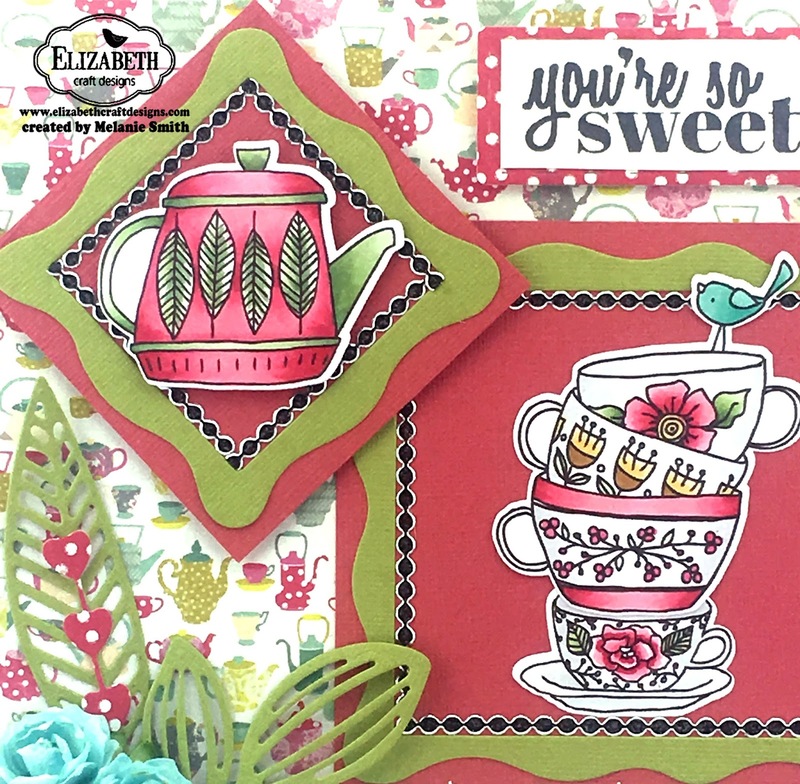 Die cut teapot and teacups with coordinating Tea Time Die Set. 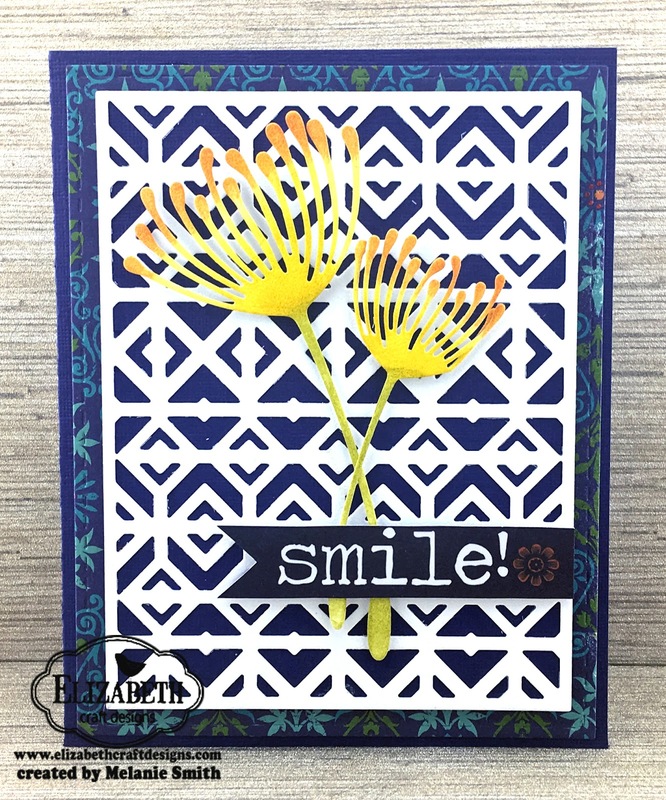 Border the sentiment with patterned paper. Border the inner edges of the green die cut frames on each square with black peel-off stickers. Adhere the teapot to the smaller square, orienting the square so it has a point centered at the top like a diamond. Adhere the teacups to the larger frame with the square oriented like a picture frame. Step 6: Arrange the squares and the sentiment as shown, leaving space across the bottom and at the bottom left for lace, ribbon, silk or paper flowers, and die cut leaves (I used ModaScrap Leafy Branch 3 and Pair of Leaves 2) as shown or any other embellishments you want. 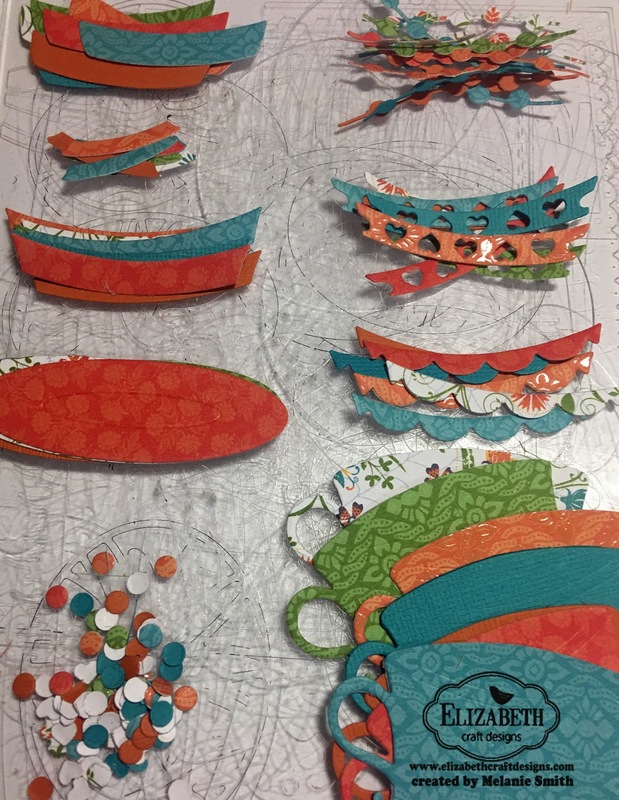 Here is a close-up of the project showing the coloring as well as the detail of the design. Thank you for stopping by today.... I hope you have a wonderful day filled with crafty moments. 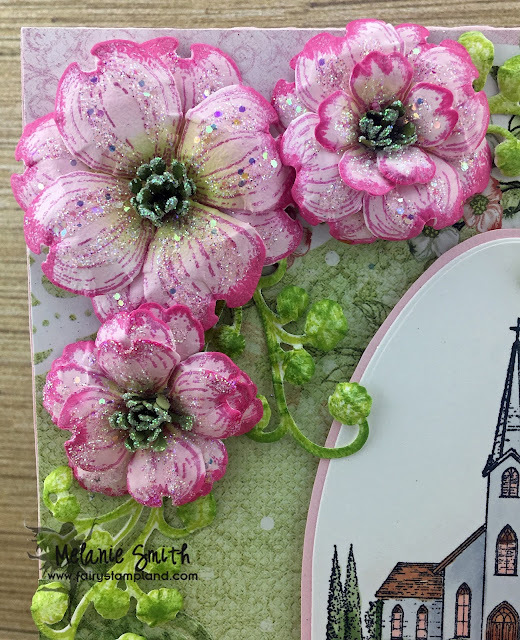 Below is my card featuring Elizabeth Craft Designs stitched dies. As soon as I decided to use the Teacup Die Set I just began cutting all the pieces out from each of the colors of paper. A little DIE overload here but boy was it fun playing with all those pieces. This is like playing with paper dolls!!! Step 1: Cut your card base which measures 10" x 7" folded which will create a 5x7" card. Step 2: Cut your Designer Patterned 4.75x6.75"
General Sentiments Stamp Set and use the Stitched Fishtail Die set to cut the sentiment out of. Step 5: Assemble your card to your liking mixing up all the different pieces to create contrast. Here is a close up of the different pieces I decided to use. I have also added a few of Elizabeth Craft Designs Glitter Dots in Silver/Gold. Thank you for all your support and for stopping by today. I purposely did not use a sentiment on this card because I want my husband to get this for Valentine's and to read the hidden message that the designer paper says "I Just Love You Forever & Always"
Above is a close up of my coloring. I have used Copic Markers as my medium. I have also used a Doohickey heart border die to frame my colored stamp along with a Memory Box die called "Drifting Flower Heart"
Head on over to the Magnolia-Licious Online Store to see a large selection of stamps and dies. Also don't forget to check out the challenge blog to participate in our current 2 week challenge. I can't wait to see what you have created!! !